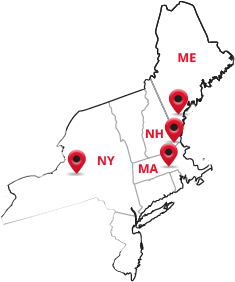 Our four locations are strategically located near multiple major highways and we deploy dozens of trucks every day to eight states – Massachusetts, New Hampshire, Maine, Vermont, Connecticut, Rhode Island, New York, and New Jersey. We´re also the only metal manufacturer in New England with direct railroad access. The savings that we realize from this major shipping asset is passed directly on to our customers. Our proximity to all points means we can go where other manufacturers do not. Twice a week, we deliver to northern Maine and to northern New York, and we´re continually expanding our reach into the farthest reaches of our territory. At all of our locations, the people who keep American Steel & Aluminum moving truly make the difference for our customers. We´re proud that most of our staff has enjoyed a long history with us, so they´re constantly looking for ways to improve our procedures, and fully invested in making sure our customers are satisfied. To learn more about each of our locations and to contact the one nearest you, click on the links below.